Magento 2 Call for Price extension by Meetanshi allows store owners to hide product prices and "Add to Cart" button to replace with "Call for price" button to encourage users to contact for product prices. Hides product prices and " Add to Cart" button. Responsive contact form to receive quote requests. Easy to manage quote inquiries. Price formation is a complex and tiresome process and thus, prices should be managed thoughtfully based on demand and competition. Many times, Magento store owners cannot provide a fixed pricing to the specific products due to many reasons such as the price is to be decided based on the quantity of the order, the price is to be based on the type of customer group, prices based on product personalization, etc. Magento, by default, does not have any functionality to hide product prices and enable contacts for prices. 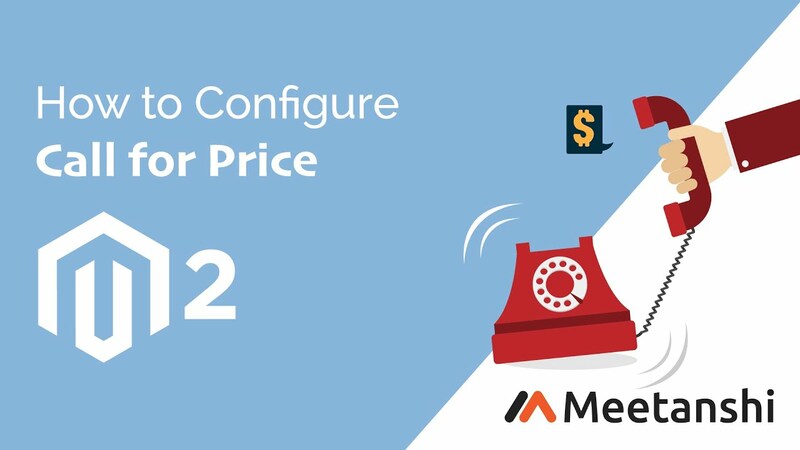 Meetanshi has come up with Magento 2 Call for Price extension that helps to hide product prices and "add to cart" button in Magento 2 stores and instead replace the price details with customized button such as "Call for Price," "Contact for Inquiry" or any other call to action button! Magento 2 Call for Price is useful for the stores where there is a constant fluctuation in prices; prices depend on the quantity of the order, products personalization or if it is a service-based product. Also, the module is helpful in improving the customer engagement. The store owner can interact with potential buyers and thus the productive communication can lead to fewer cart abandonment and more conversions. The extension allows replacing the price details with a "call for Price" button that enables "Get a Quote" form in a responsive popup. The form contains essential details for the quote request. Such information helps in better understanding the visitors' requirements, improve the product features and marketing efforts. Enables communicating directly with potential buyers. Option to select one of the call for price scopes. Select one from the button or label to enable call for price as. Set the custom text for the selected button or label. Enable call for price based on customer groups. Hide prices on the product page, category page as well as home page. Enable a call for price pop up form for the button type to allow users to fill the details and submit the quote inquiry. Set the custom title for the call for price form. Set Email ID of the store owner to receive the call for price requests from customers. Select the Email sender and template for the new quote inquiry Email to the admin. Enable auto-reply Email to customers after they submit the quote inquiries. Enable privacy checkbox in the call for price inquiry form to force customers to agree with the policy to comply with EU's GDPR. Avoid spammy call for price inquiries by enabling Google reCAPTCHA in the popup form. Set a custom button or label text from the product edit when the product-specific call for price is enabled. When the button type is set, users can click the button and fill the inquiry form to contact for the quote. Immediately after the inquiry is submitted, the users get an acknowledgment Email notification. Admin also gets an Email for the new quote inquiry. Product name appears as a subject of the email received by admin to get him the idea about customers' interest of products. Easily manage inquiries from the admin panel with a grid having users' details like Name, Email ID, contact details, products they are interested in and their inquiry message. Support for all Magento default product types. The module is easy to use. 1.0.1 Compatible with 2.3 and PHP 7.0.2.